Why the name 121 Cluster? 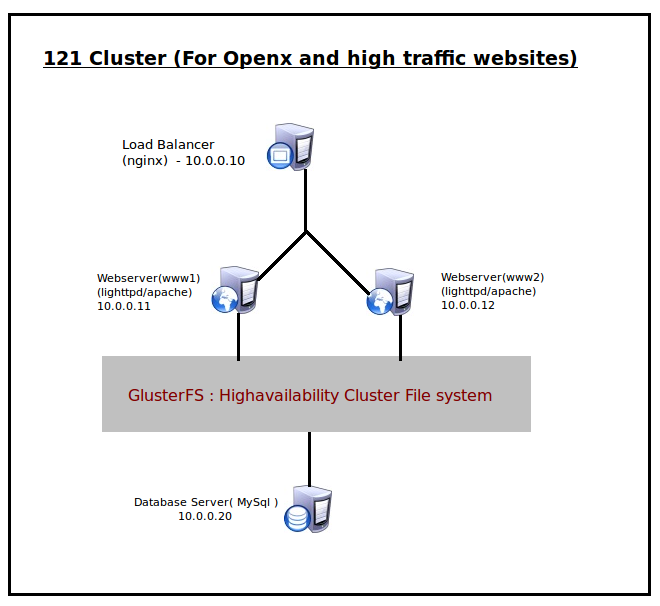 Disclaimer :Please notices this document will help you for configuring an simple highperformance cluster for hosting Openx services. This article is licensed under Creative Commons Attribution-No ncommercial 2.5 India .Please don’t copy and paste the configurations to your server if it is not the hardware that mentioned in the hardware requirements. # Short-Description: nginx init.d script for Ubuntu 8.10 and lesser versions. # Description:       nginx init.d script for Ubuntu 8.10 and lesser versions. # nginx - this script, which starts and stops the nginx daemon for ubuntu. #               server and its process state. # Notes: nginx init.d script for Ubuntu 8.10 and lesser versions. echo "$NAME found running with processes:  `pidof $PS`"
log_daemon_msg "Reloading (via HUP) $DESCRIPTION"
log_daemon_msg "Force terminating (via KILL) $DESCRIPTION"
Now it is time to optimize your servers.